A football-sized hole appeared in the fuselage of Flight 2294's 737. A Southwest Airlines jet in which a football-size hole opened in the top of the passenger cabins had troubles in its last inspection in January. Government records show that 11 cracks in the plane's fuselage frame were found and repaired during the aircraft's 14-year checkup in January. The aircraft made an emergency landing in West Virginia on Monday after the passenger cabin became depressurized after a hole appeared in the fuselage. In a May airworthiness directive, the Federal Aviation Administration issued a warning about possible metal fatigue on Boeing 737s near the spot where the hole appeared. The FAA said the skin of the fuselage at the base of the dorsal fin (the back tail fin) could be susceptible to metal fatigue and cracking because of pressurization and consequent rapid in-flight decompression of the airplane fuselage. “If there is a problem -- whether loose screws or a crack -- after the expanding and contracting of the fuselage time after time, eventually not only will it come loose, it will come apart,” said aviation expert Denny Kelly. But the FAA said it has never seen a hole open up in a plane in the spot where it did in Monday's incident. On Monday, the 737 became depressurized about 30 minutes into the flight, causing oxygen masks to drop. Local Airport Authority spokesman Brian Belcher said passengers on Flight 2294 could see the outside through the 1-foot-by-1-foot hole in the rear of the plane. The flight was diverted to Charleston's Yeager Airport and landed shortly after 6:30 p.m. Belcher said the plane, which originated in Nashville and was headed to Baltimore, landed without incident. None of the 133 people on board were injured. The airline placed the passengers on another plane to Baltimore. The aircraft is 15 years old, one of the older 737s in Southwest's fleet. Dallas-based Southwest said Tuesday it inspected all 181 of its Boeing 737-300-series jets overnight before putting them back in the sky. The airline said it was unclear what caused the hole, which ripped open just in front of the vertical tail fin as the plane cruised at 30,000 feet. Experts said the tear could have been caused by damage from a dent or ding, or the plane's skin could have suffered from age-related fatigue. Jet cabins are pressurized and depressurized with every flight, which can cause tiny cracks over time. According to preliminary results of the FAA's investigation, the repetitive inspections called for in its airworthiness directive would not have prevented Monday's incident. The order did not cover that part of the plane, the agency said. 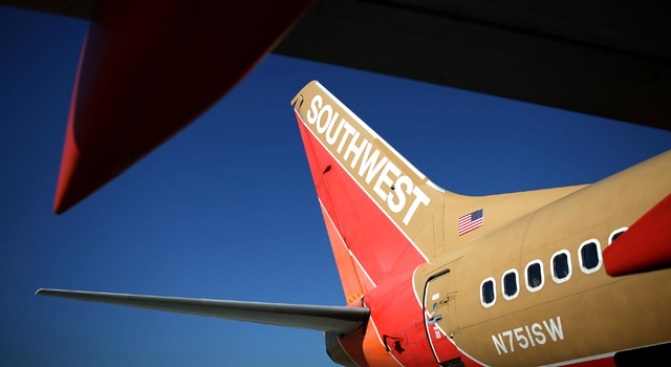 In March, Southwest agreed to pay a $7.5 million civil penalty imposed by the FAA for operating nearly 60,000 flights in 2007 on planes that had not undergone required inspections for cracks in the fuselage. About 1,450 flights took place after the FAA had notified Southwest of the missed inspections. Grant Stinchfield contributed to this report.